- $20,000 awarded for each "skin" , for a total of $360,000 in prize money. 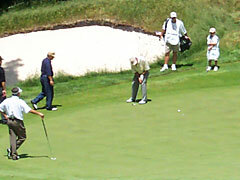 - The money is not awarded for a skin until the player "validates" by winning or tying the next hole. 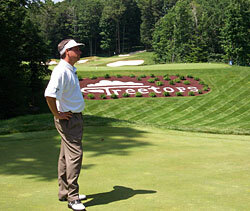 - If a hole is not won and validated on the following hole, the prize money "rolls over" to the next hole. 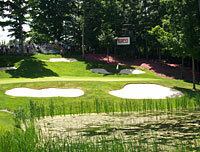 - $10,000 awarded on each hole for the closest to the pin (has to be on the green to count). 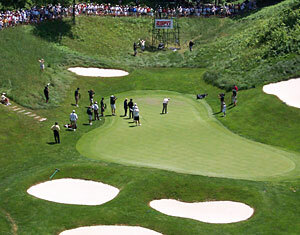 - $1,000,000 awarded for each hole in one - counts in the contest for the championship honors. Threetops was the queen for this tournament however, with the event sold out and with media from all over the United States here to cover the Shootout. Bill Kratzert, a respected announcer for ESPN, was making one of his final television appearances before hitting the road to join the Senior PGA Tour. After finishing his TV commitments this season, he plans to devote his time to life on the road in Senior PGA Tour events. Bruce Devlin and Roger Twibell were also on hand. 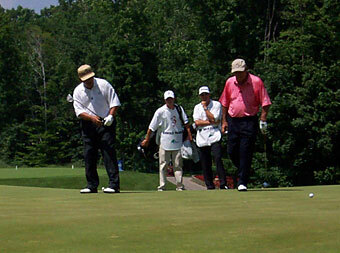 Following is a "collage" of sorts - designed to create a picture of the tournament happenings, leading to the awarding of the trophy to the 2002 Shootout Champion. Couples misses a four footer on the 8th green during the first day, and fails to validate what would have been 7 skins worth $140,000 in prize money. Trevino does not have the magic this year, as he also narrowly misses on number nine. *note - some of the pins on the short par threes had to be placed near the back of the greens to meet insurance requirements for a hole in one contest. Palmer barely misses a long putt on number six - the group's last chance to stop Couples from validating for 14 skins. Freddie tapped in for par and the apparent victory! 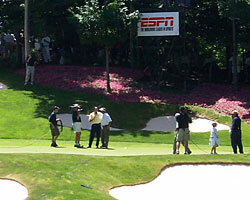 Leader Fred Couples being interviewed on the sixth green by Bill Kratzert. Still a chance for a hole in won to steal the victory…Arnold Palmer comes within inches on Lee Trevino's old stomping grounds, narrowly missing an ace on the seventh. 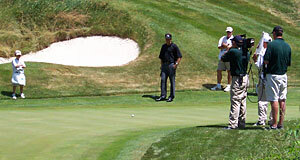 He taps in for birdie, and must win or tie on the 8th for $20,000 prize money. Couples birdies instead, and now has the chance to sweep the skins with a win or tie on the ninth green. Couples ties the hole and takes all $360,000 in skins money, along with $80,000 for 8 closest to the pins - for a grand total of $440,000. 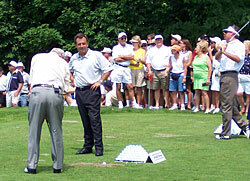 On the ninth tee - that's Daniel in the center, getting tips from dad, Lee Trevino. Palmer, Mickelson and Couples were entertained throughout the tournament (as were the media and spectators) by Lee's constant banter, which certainly provided a lift to the event. His good-natured barbs are genuinely appreciated by all, as Mr. Trevino is one of the most respected gentlemen on tour! His presence at Threetops is worth the price of admission. This event was even more special to him this time around as the defending champion, as Daniel was his caddie for the 2-day event. Couples is presented the trophy by members of the Melling family, with Bill Kratzert as the emcee. 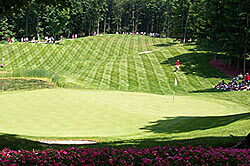 For a link to the Two Guys Who Golf webpage for Treetops Resort with links to information pages and reviews for all their courses, click here. 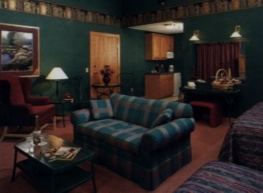 The Two Guys Who Golf also visited the Otsego Club Resort in Gaylord, which features excellent accommodations and 4 championship courses. 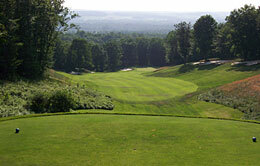 Click here for our reviews of the Otsego Golf courses. 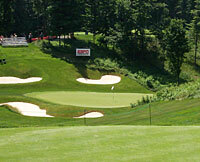 Northern Michigan Golf - there is NOTHING like it!